“Some day my prince will come” may be a vain hope in real life but in fairy tales the imagination can satisfy any fantasy. Cinderella’s similar hope is more rooted in reality but her prince comes anyway. As portrayed by Wallis Giunta in this production there is no wonder. What prince could resist her looks, demeanour, personality and coloratura. Opera North’s publicity poster photos of Wallis Giunta clearly mimic those of Lily James for the 2015 Disney remake of Cinderella but the Company’s take on the story, although making some attempt to be one for our times, is not Hollywood/ Disney nor La La Land for that matter. The rather dowdy dance studio of the setting is owned and run by Don Magnifico who attempts to own and run his two daughters in an enterprise to marry them off to secure his selfish advancement. His stepdaughter Angelina (“Cinderella”/”Cenerentola”) is used to sweep the dance floor and do the chores. The scene is set. Cinderella keeps singing an old song that tells of a King who falls for and marries a girl of common class and there is a neat smoke and mirrors trick in conveying her dreams. As she dances in front of the studio’s giant mirror there is, reflected back, a live golden image of her in a magnificent ball dress. When we get to the real ball, the mirror is replaced by a proscenium arch, the curtain drawn to reveal the glamorous, assembled throng. Although there is a low budget feel to the production the up side is that there is minimal distraction from what really matters: the wittily choreographed stage-business handled by singers who have to cope, often at the same time, with the hair raising patter and elaborate coloratura that is the stuff of Rossini’s Italian comic opera genre. 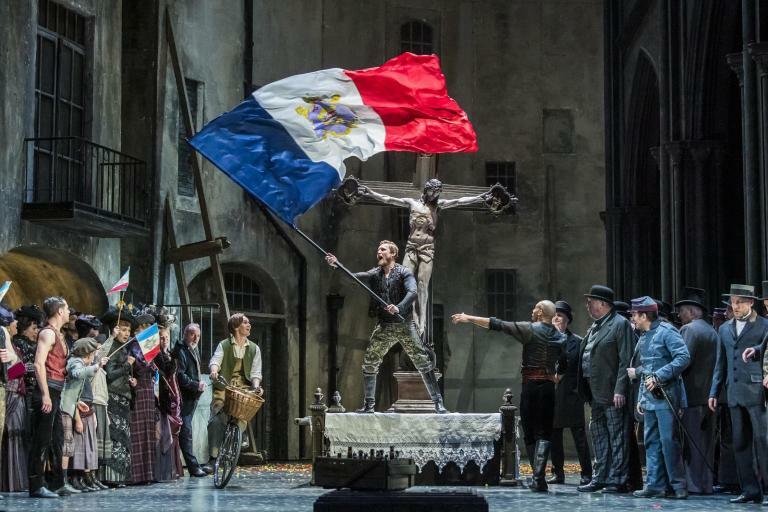 The strong cast reflected Opera North’s repeated, successful formula of matching one or two seasoned veterans with young talents that are in the process of establishing themselves on the international operatic stage. Seniority is provided by Henry Waddington as Don Magnifico who did an audience-pleasing turn as a kind of portly Italian maitre d’hotel, suitably moustachioed. Sky Ingram and Amy J Payne as the “ugly” sisters of the original were a splendid double act, alternately showing to each other spite and solidarity, fawning to the Prince and bullying Cinderella. Sky Ingram as the only soprano has the responsibility of carrying some of the highest notes in the opera, and, in hitting her high Bs in the final ensemble she displayed accuracy and aplomb. Quirijn de Lang was Dandini, Prince Ramiro’s valet who has to disguise himself at first as his master. He well represented the transition from nervous servant to confident royalty before having the role wrenched from him just as he was beginning to enjoy it. Alidoro is the tutor/philosopher who supplants the story’s fairy Godmother and John Savournin distinguished with a baritone voice both powerful and movingly lyrical. Sunnyboy Dladla had all that was required of the Prince: good looks, a commanding stage presence and a ringing tenor voice that has to cope with vertiginous high Cs and Ds. Much depends on the vocal capabilities of whoever sings Cinderella. Rossini’s female leads in his comic operas were usually Mezzo-Sopranos who had the skill to deal with the virtuoso, coloratura ornamentation of cascading rapid runs and leaps, often having to fit them into otherwise lyrical arias. The specialist breed of Mezzo required of the parts virtually died out for a hundred years after Rossini’s heyday but has returned in recent decades. Canadian Wallis Giunta has what it takes. So effortless and liquid were her runs she gave the impression of being born with coloratura skills. Even more important was being able to fit in the ornamentation while, in the more lyrical moments, maintaining the integrity of an aria’s melodic line. With her lyrical Mezzo and slight, graceful physical frame, it came as quite a shock when she hit high notes that carried real decibel punch. Opera North’s male chorus are noted for their power and this was on full display, the men representing the Prince’s entourage of officials and general hangers-on, dressed in costumes ranging from suits to traditional cricket blazer and general scruff. Veteran conductor Wyn Davies managed to hold all together which is a tall order when it comes to the frightening musical antics of the climactic ensembles. These moments were on the edge but were pulled off with considerable energy. Rossini and his librettist cleverly discarded all the magic of the original story: the carriage, the mice, the pumpkin. They even jettisoned the glass slipper. Yet the fairy tale nature is maintained with a “bounding floodtide of fantasy” as Rossini’s early biographer Stendhal put it. The result is a fairy tale invested with a humanity rare in comic opera outside Mozart. If you need a dose of feel good factor go and see this show. On a grey, drizzly night in Leeds it was as good a tonic as any. After Leeds the production tours to Newcastle, Salford, Belfast and Nottingham.